We could here simply just show you how this idea is rendered in the metals we supply. But coincidentally, there is a new book that addresses this generic subject and re-states ideas that bear directly on what we—and you per the jon specs--- do in this regard. In the aptly named book, “The Perfectionists”, subtitled as “How Precision Engineers Created the Modern World”, author Simon Winchester traces this concept back perhaps not as far as you might at first think. Very good arguments can be made that the Pyramids, or Stonehenge or even Brunelleschi’s Dome on Florence’s Duomo (Santa Maria del Fiore) Cathedral have a remarkable degree of “perfection”. But this is not to the fine degree that Winchester points to as commencing with the introduction of steam energy, relatively recently in the 19th Century. From that point, the book goes on to stress that, though great things were done prior to the steam, and then the internal combustion, engines, these then empowered men (and later women, of course) to make truly precise parts. The example of Henry Ford’s assembly line is cited as the first real instance of precisely-made, identical, and therefore interchangeable, parts allowing efficient cars to be manufactured, one after another, all the same. [Recall that the original Henry Ford quipped of his Model T that “you can have it in any color you want, as long as it’s black.”] Even Henry Royce, the founder and the pseudonymous exemplar for old-fashioned QC as he hand-made the first Rolls Royce Silver Clouds didn’t get to “precision’ the way we all have since Mr. Ford. Royce hand–finished needed parts to the degree needed for EACH individual car as it was built. No production line vehicles for the Gilded Age zillionaires!!! Ford’s great step forward was what we manufacturers do every day in implementing tools & dies to make all repeat parts IDENTICAL, and therefore interchangeable. When we here at Metfab Metals fulfill an order of multiple/repeat custom parts, we often fashion a tool & die set or a computer model to enable our staff to NEVER vary from the exacting specs that our jobs almost always mandate. For those not already convinced of the importance of precision engineering, there is the disconcerting story of a 2010 Qantas flight. The two year-old, double-decker aircraft’s engine exploded in the air, putting the lives of nearly 450 people in grave danger. The failure was traced back to a tiny pipe that was machined only slightly imprecisely. The drill bit used to create the hole was misaligned, leaving the tube about half a millimeter too thin along one small portion of its circumference. Then there was the Hubble telescope, which turned out to be, at least initially, a public embarrassment. As the world anticipated the best images of space ever, they instead appeared blurry and unclear----a huge disappointment. Well, Metfab Metals is not as old as the steam engine (though our roots go back to Jim’s immigrant grandfather’s tool & die shop opened in 1947), and we don’t usually machine parts for jet engines or Hubble telescopes, we DO make parts daily to very critical tolerances, for billion dollar buildings (and far more humble, but precise. jobs too). In ALL of these, we seek--and deliver-- 100% compliance with the specs, as given to us, pre-engineered and computer-drawn. 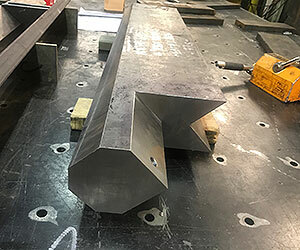 Hudson Yards, NYC, NY----- “The beat goes on!” More than four (4) years after we supplied our first parts here, we are yet delivering weekly to this megalithic development on the West Side of Manhattan, including a whole spectrum of AESS parts, assemblies and mullions. The Hudson Yards’ Culture Shed (now simply referred to as “The Shed”) calls upon us to fashion unique “pans” to hold the stone that will project a floor appearance rarely, if ever, created before. PennFirst, Philadelphia, PA ----- We are doing the highest level of AESS work here again in fashioning many specialty metal anchors and miscellaneous fabrications. The “beat goes on” here too for our precision work. 1. Book Review by Roma Agrawal of “The Perfectionists”, subtitled “How Precision Engineers Created the Modern World”, by Simon Winchester (2108, Harper/Harper Collins Publishers), New York Times, Book review supplement, June 17, 2018, p.16.